We carefully selected the most natural eye make-up brands and cleaners that are safe and non-irritating to the eyes. Eye Doctor approved! If you don’t like mainstream, our studio offers independent frame and eye make-up lines that will give you that distinct eye appeal that will have people talking. 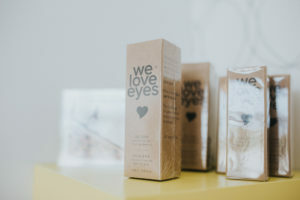 We carefully selected the most natural eye make-up brands and cleaners that are safe and non-irritating to the eyes. Eye Doctor approved! Can’t make a decision on a frame or looking for a new eye makeover? No problem, we are here to help! We have a highly trained team that will attend to your individualized eye care and eye beauty needs to provide an exceptional and tailored optometry experience from the moment you make your appointment until you leave. Let us pamper you with a relaxing eye massage after your examination using our Thalgo Eye Mask. 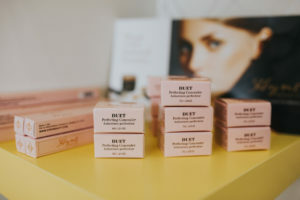 We also offer a line of organic-based, vegan makeup by Hynt Beauty that is free of toxins and paraben. We love eyes and so should you! We carry eyemakeup remover oil and eyelid foaming cleanser from We Love Eyes.